Please note, everything on this page is provided "as is". Not everything is a shiny final piece of work. You might require additional software or skills to get working how you want it. Also please feel free to adapt and improve anything here, all I ask is that you share the knowledge. An exploration of some techniques and ideas in both 3D and photographically to create some cool lighting effects. Including stuff like how to make real life light-spinners or free virtual lighting shapes to download. This tutorial shows how you can use a Media Player and other cheap hardware to take photos with your SLR. This is an attempt at modelling an animation concept. The scenery rolls 360 degrees around the X axis for the duration of the animation. Aka it rolls, while the figure doesn't. Plus theres an optional backplate to give the impression of a rising horizon. This tutorial is an extension to the ones below and covers how you can create anaglyphic movies using only Poser and simple software. Movies that can be watched on an standard HD TV. Also covers how to get the videos from your PC to your telly. This tutorial describes how you can extract 2 images from a single .MPO file (photos created by real 3d cameras) and use these within Poser. It also contains instructions for making static anaglyphs from renders, plus some hints, tips and examples. Inspired by some kids 3d drawing toys, here's a very simple prop with an anaglyphic grid which when viewed with Red/Blue 3D Glasses causes your figures to stand out. Also useable a basic background prop for square photos. Click the thumbnail while wearing the glasses to see a demo. 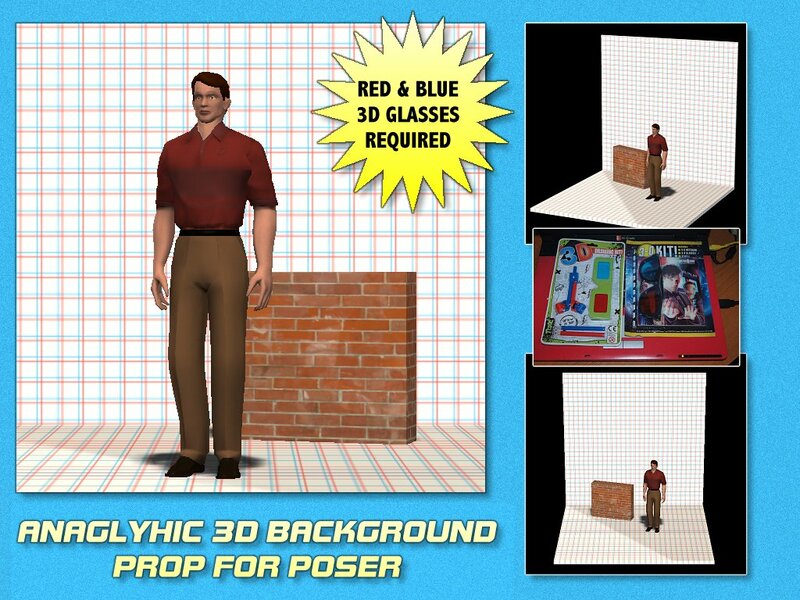 This is a fully working model which replicates Parallax Scrolling within Poser, Daz Studio and Vue. Parallax Scrolling is "a special scrolling pseudo-3D technique in computer graphics, which creates an illusion of depth in a 2D image". Press the play button - bottom right corner - to start the video. For more detailed information and full instructions, please read the readme.txt file within the zip file. Also the flash video below is a quickly done low res demo. When used well, the model can create high quality images and animations. Also many thanks to Vanishing Point for rigging this for me. This tutorial shows you a very simple to way of faking DOF (Depth of Field). Works great for both animations and static renders. Based upon the the work of Antonio-Perez Melero. This working model is akin to lenticular prints. But instead of moving the image to see the picture you need to "walk" around the artwork and view it from different perspectives to see the the effect. Theres no image here, because that would spoil the surprise. A tutorial for Vue 5 infinite (and higher) which shows how to use single photographs within Vue to make backgrounds with matching IBL lighting. Working poser model thats designed to simulate distances in Poser without bogging down your system. Mapped to take most digital photographs. This easy to use tutorial shows how to use alpha planes within Poser, particulary with animations. Also discusses how these can be used to create Chromakey Overlays and an simple idea regarding animated 3D Decoupage & Back Projection. A zippd .pdf file which explains some of the texturing techniques I've used on models before. It's a very old file, but some folks may find it usefull.